Front left swatch, center button band at left. 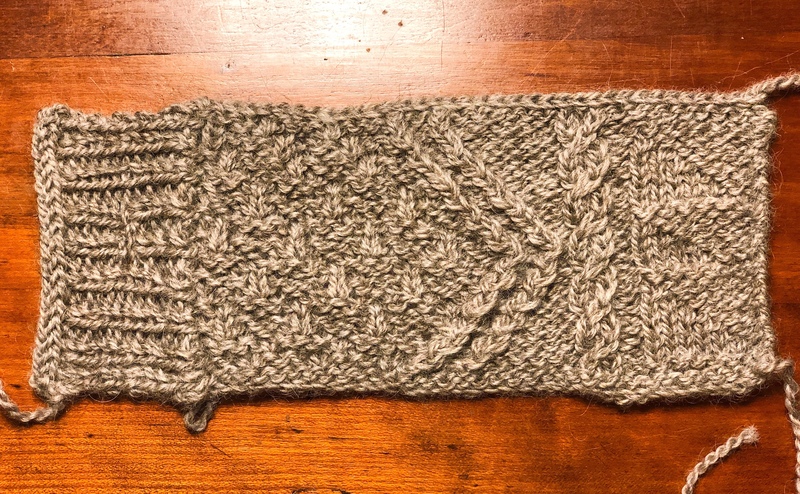 Working from the center left, the front features a reversible broken garter rib pattern framed by a 12 stitch by 24 row twist-stitch double zig-zag cable, then a slip stitch cable, and knit purl flag pattern. This pattern will fit between the sleeve cap seams, contrasting with the rest of the body and most of the sleeves in plain stockinette. 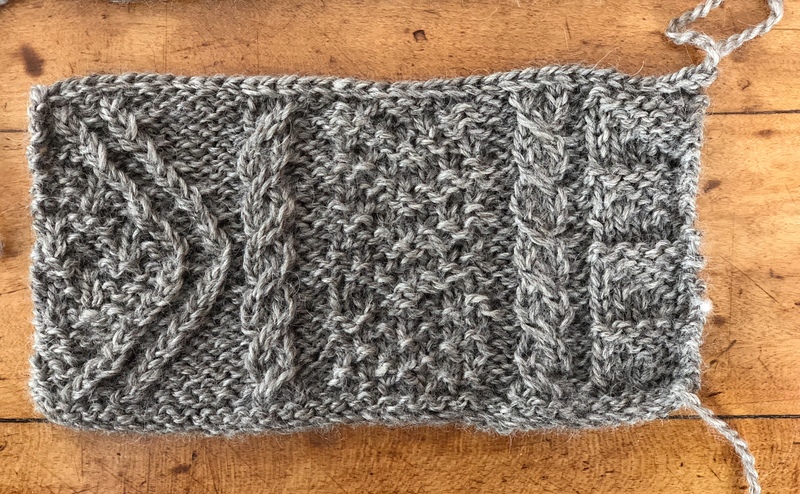 The broken garter rib pattern will be carried through the whole collar. Button band at left is a double-needle pickup in 1×1 rib, picked up at a rate of 3 stitches per four rows. Three-stitch buttonholes will be centered at the midpoint of the zig-zag as shown here. The button band is bound off with a three-stitch i-cord. I’m thinking of using very simple one inch diameter two-hole buttons in natural shell. Equipment note: Ribbing and i-cord on size 6 needles, the main body on size 7. I’ll be using wood laminate needles for their sharp points and good blend of glide vs. stickiness for the cable and slip stitches — my usual metal tips were too slippery, and bamboo were not sharp enough and a bit too sticky. 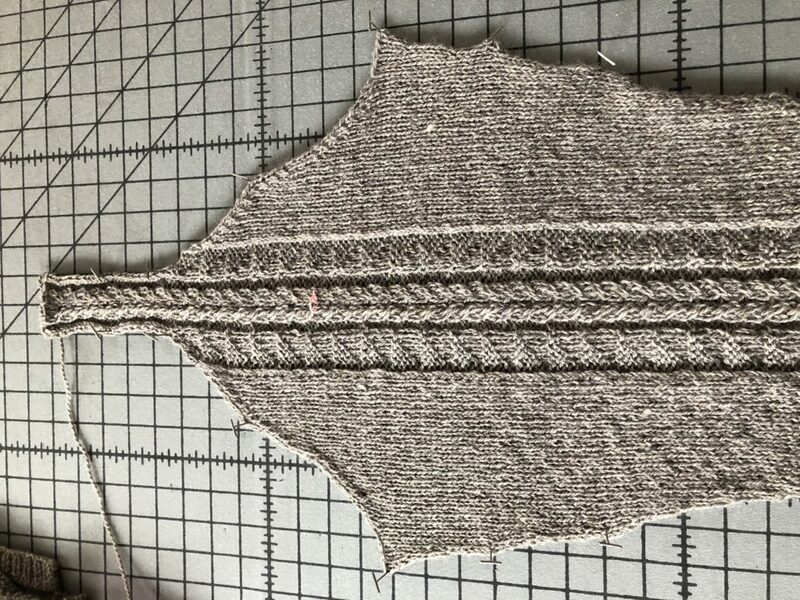 Getting the sweater lapels reversible with a cable motif as I had planned is beginning to seem daunting, but on reflection not all of the front panel will be turned back, just the portion across the neckline opening minus the overlapped button bands. 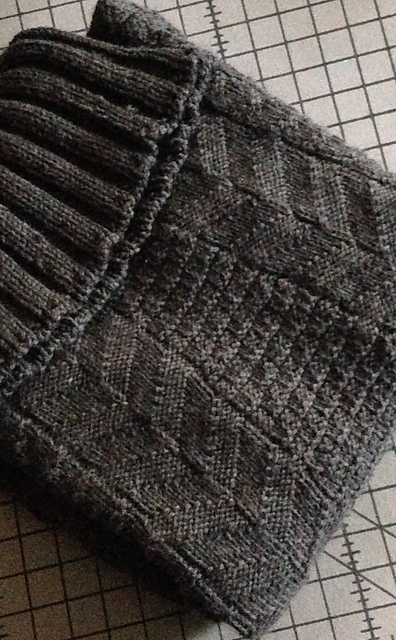 Fourteen to twenty-three stitches in reversible patterning is entirely manageable. Spread-collared cardigan with applied button bands, saddle shouldered set-in sleeves, set -in side-entry pockets, and a side-slit hem with a slightly dropped tail in back. Panels of textures stitches will be featured on the fronts, back, and possibly across saddles and down the sleeves. The intent is to add textural interest without bulk or stiffness, maintaining the natural drape of a longwool knit. 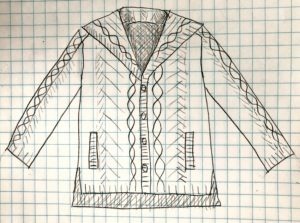 The collar stitches are picked up from the back neckline while knit continuously from the front pieces, so that the collar fits like a loose fold-over turtleneck when buttoned all the way up, and like a sailor collar when unbuttoned to the sternum (as shown in the sketch). Use: This sweater is intended for indoor or light outdoor wearing . Fit: The intended fit is body-skimming with minimal shaping, to be worn over a blouse or jersey, low-hip length. 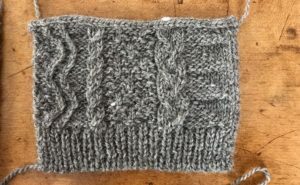 * reversible cabling may need to be abandoned if it proves too bulky when swatched. 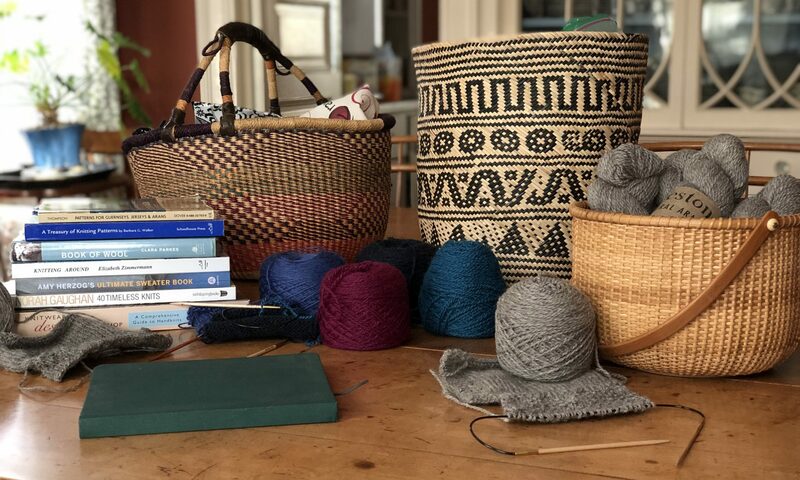 Inspiration: Patterns for Guernseys, Jerseys & Arans by Gladys Thompson, Bárbara Walker’s stitch dictionaries.